WallCandy Night Lights 2 (msdsowcanight) at Pure Design Kids / Toys / Wallcandy ::: Kids' Toys, Furniture and More at Pure Design Kids! 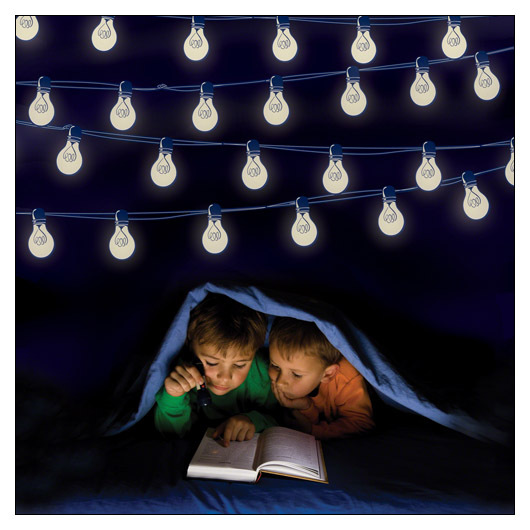 Camping inside just got even more fun with the NEW WallCandy Night Lights! These removable stickers come in a set of 18 feet of glow-in-the-dark lights with 30 glowing bulb decals that measure 3-5/8” each. Please allow an additional 2 weeks to ship.